The upcoming href=”http://www.sony.com/” rel=”homepage” target=”_blank” title=”Sony”>Sony phone code-named Kumquat will be called href=”http://www.sonyericsson.com/” rel=”homepage” target=”_blank” title=”Xperia”>Xperia U. 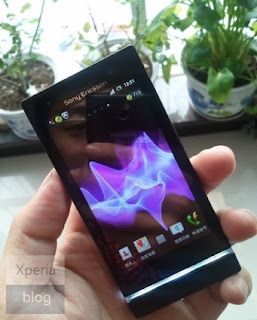 It features the same transparent strip conceit as the Xperia S, the same shape, the same overall design – in fact, the only visual difference appears to be in the resolution department, estimated to be 480 x 854 (FWGA) rather than the Xperia S’s 1280 x 700 Reality Display (kudos to the eagle eyes over at the Xperia Blog for spotting that). You can’t really tell from the photo, but the screen size is also apparently smaller than the Xperia S – 3.5-inches on the U compared to 4.3-inches on the S.
On the inside, details get fuzzier still – rumours speak of the Sony Xperia U featuring a 1GHz dual-core processor, a 5MP camera and running href=”http://code.google.com/android/” rel=”homepage” target=”_blank” title=”Android”>Android 2.3.